A fast free cooperative multiplayer game The main idea is to move around in a level, you are suppose to solve several puzzles. Most puzzles are constructed so they can only be solved by working together (teamwork). To reach to next level both players must have reach the exit. "To reach the end of this cooperative multiplayer game both players must be working together." Teamwork to succesfully complete the levels of this multiplayer cooperative game is the most important. Here is a list of all other features that you will find in this cooperative multiplayer game. - Fast graphic render engine. Layer and rectangle animation. - 12 unique cooperative levels to explore for you. - Enhanced server/client sync threats. - TCP/IP layer with data-loss recovery routines. - ICQ support and command line support. - Movable items, powerups, doors and teleporters. - Text balloon rendering, the enhance chat experience. - Great graphics and SOUNDS to make it complete. - Comes with easy installer. 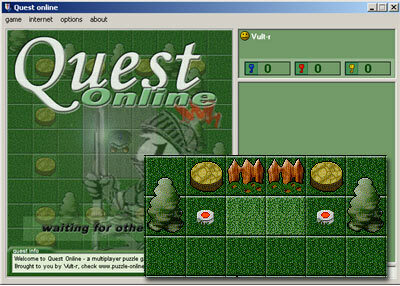 This is a screenshot of this free cooperative game. The screenshot is resized to fit on the website. The size of the actual game is bigger.